It's Inspirational Wednesday at Heartfelt Creations and today I have a pretty, mailable birthday card for you using the beautiful Sweet Peony Collection. I think it would be a great card for either a man or a woman. 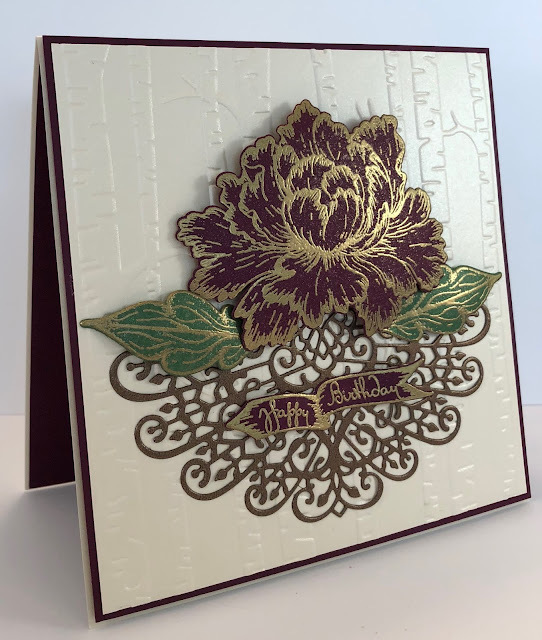 Other Products: Champagne Pearl Metallic Cardstock, Dimensional Tape, Stampin up Woodland Textured Embossing Folder, Stampin Up Rich Razzleberry Cardstock, Bronze Metallic Cardstock, VersaMark, Sparkle Sheer Shimmer Spray, Dimensional Dots, Big Shot. Instructions: Create a 6” x 6” card base by cutting champagne cardstock 12” x 6”, score and fold at 6” on the long side. Cut a mat layer from Rich Razzleberry cardstock 5 7/8” x 5 7/8” and cut another one for the inside of the card. Cut another layer from champagne cardstock 5 3/4” x 5 3/4 and emboss with the Woodland Embossing folder. Adhere to the Rich Razzleberry layer with dries clear adhesive and then adhere to the card base with dimensional tape. 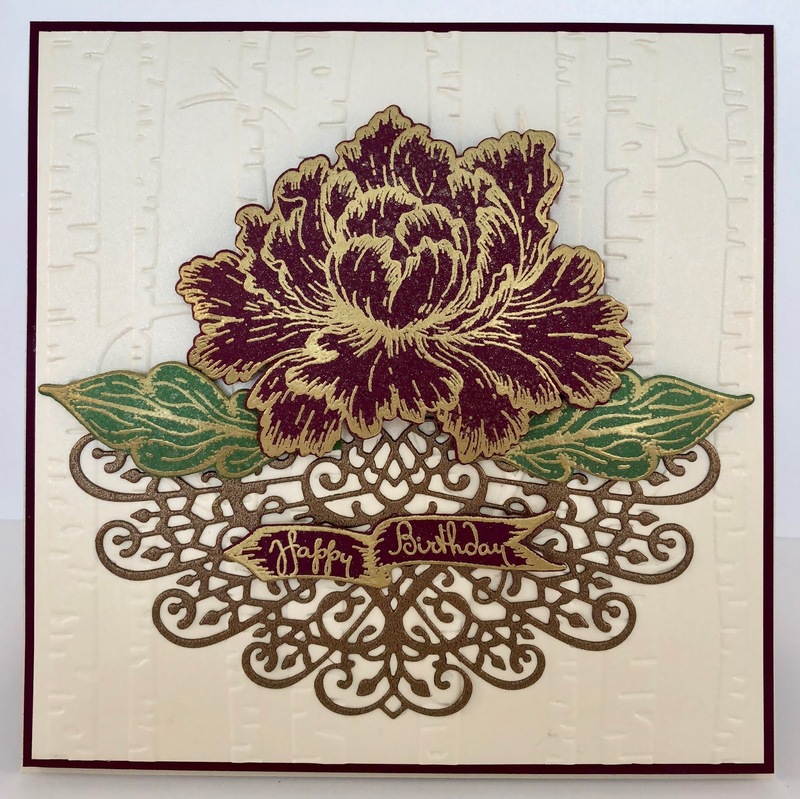 Stamp the large blossom and the Happy Birthday on Rich Razzleberry with VersaMark, stamp the leaves from the Large Peony on green metallic cardstock with VersaMark, sprinkle them all with gold embossing powder and heat set using the Heat It Tool. Die cut with the coordinating dies and lightly shape using the Deluxe Flower Shaping Kit. Spray with Sparkle Sheer Shimmer Spritz. 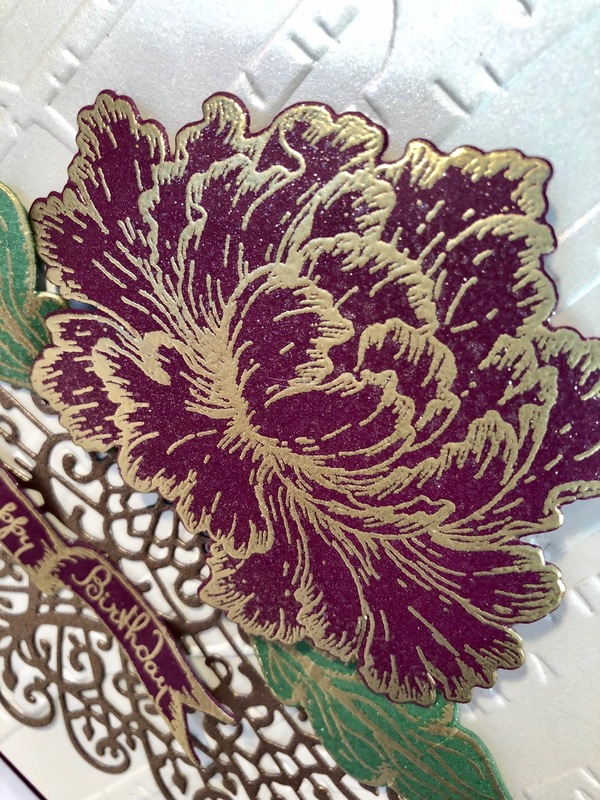 Die Cut the Decorative Medallion Die from bronze metallic cardstock. Adhere the Decorative Medallion to the card front with dries clear adhesive. Adhere the leaves with a combination of dries clear and dimension dots. Adhere the Large blossom as shown using the dimensional dots and adhere the sentiment with dries clear adhesive. Thank you so much for stopping by...I so appreciate you! Wow what a dramatic and stunning card!!! Beautiful Janet!! Love the gold embossing! !